Your residential fence needs a little extra TLC to keep in top shape! Read on for more information on cracks. Your beautiful new residential wood fence is something you invested time and money into to protect your home, accent your landscaping, and give some major curb appeal to your property. However, wood fences can require a little extra maintenance and TLC to keep them in top shape. Cracking and splitting can take a major toll on the appearance of your fence and its structural integrity. How can you prevent cracking and ensure your wood fence remains sturdy for years to come? Why Do Wood Fences Crack in the First Place? There are many types of cracks that occur naturally in wood, which is why they can be tough to prevent. Checking is one of the most common types, and it occurs as wood dries out after being chopped. The inside of the wood typically dries at a slower rate than the outside of the wood, so checks form. 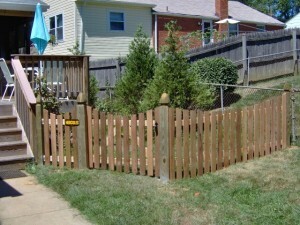 You might notice checking on your fence as it settles in or you may only notice checking once the summer heat sets in. Checks are typically small (less than four inches long and less than a quarter inch in width) and they don’t typically affect the structural integrity of the wood fence. Checks are a type of early crack that forms during the seasoning process, so by choosing pre-seasoned wood for your wood fence you can avoid this problem early on. If you don’t have a choice, applying sealants to the surface of the wood can improve the chances of it drying evenly and not forming a large number of checks during the seasoning process. The installation process can also cause cracking, especially when thinner or more fragile types of wood are used. Low grades of wood are not typically recommended for the greater surface area of your wood fence, as they can have a lot of issues with cracking and poor structural integrity. As your fence is installed, make sure you choose a contractor like Hercules Fence Northern Virginia that knows what they are doing. Screws are the best way to secure wood fence boards, as nails cause a lot of splitting and cracking issues. This entry was posted on Friday, September 23rd, 2016 at 12:47 pm. Both comments and pings are currently closed.